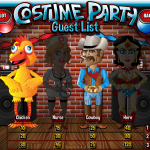 Costume Party is a 3 reel 3 paylines slot game released in 2016 by Rival. This is one of the latest games in Rival’s arsenal and really unique among the other 3 reel slots. The theme here is a costume party as you might have guessed. You have 3 characters on the reels and you can choose to play with 1, 2 or 3. You need to form a full costume for each character so in reality each one acts as a payline. There are 8 characters in total. The Wild here is a Gorilla Body. It will replace all other costumes to complete a winning combination and will appear only on the centere body parts. 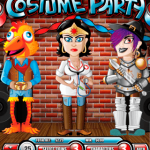 Costume Party is a 3 reel slot game but not at all a classic one. We really loved Rival’s interpretation to the Genre and this game is very engaging. The RTP stands at 95%. If you’re a fan of 3 reel slot game then maybe you should consider playing Chicken Little a 3 reel slot by Rival.